Past Prime Warden Adrian Oliver represented the Prime Warden during the Lord Mayor's Annual visit to Treloar's College in Hampshire on the 8th March. During the visit, Adrian presented a cheque for £5,225 to the College which represented the proceeds of the sale of a Swan, specially made by blacksmiths from all across the country, which was paraded through the streets of London during the 2016 Lord Mayor's Show. Treloar's was founded in 1907 when the then Lord Mayor of the City of London, Sir William Purdie Treloar, set up a 'Cripples' Fund' as his mayoral appeal. His aim was to build a hospital and school outside the city for children with non-pulmonary tuberculosis. On June 13th of that year, he wrote in his diary that Her Majesty Queen Alexandra 'came to Mansion House to open the Queen's Fete in aid of my Cripples' Fund'. In 1908, Sir William opened his school and hospital in Alton, Hampshire. Since then, Treloar's has steadily grown and developed, becoming one of the country's leading providers of education, care, therapy, medical support and independence training for disabled young people. 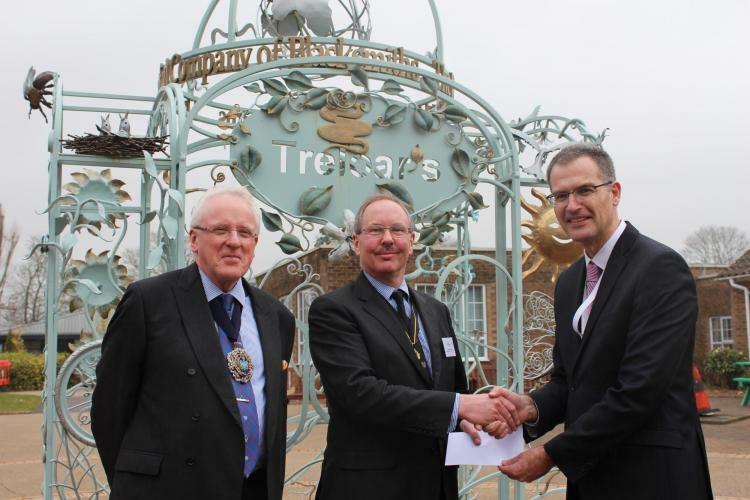 Treloar's maintains strong links with the City of London and Livery Companies for fundraising.